With a compound annual growth rate of 28.5 percent forecasted by 2020, the global Internet of Things (IoT) market is exploding, and the technology behind IoT continues to evolve at a feverish pace. Here at Microsoft, we’re working hard to secure, simplify, and democratize IoT so that every customer can transform business, and the world at large, with connected solutions. This is why Microsoft has committed $5 billion to IoT over the next four years. While IoT offers companies across industries a wealth of powerful benefits, the reality of implementation poses serious considerations such as security, complexity and scalability--not to mention keeping up with all the innovations flooding the market. In the run up to the IoT in Action kickoff event for FY18 (where you’ll definitely learn more), I’d like to briefly touch on some key areas to consider when preparing to build out your IoT solution. Did you know that more than 9 billion microcontroller units (MCU) are deployed each year? From a risk standpoint, that’s 9 billion more opportunities for compromised security. Which means, making end-to-end security a priority from the start is a top priority. Recently, as part of our commitment to secure IoT, Microsoft introduced Azure Sphere, which is the industry’s first holistic platform for providing security for MCU devices. Azure Sphere combines cloud security, a secured OS, and a secured MCU to protect and power devices at the intelligent edge. It also fully addresses what Microsoft has identified as The Seven Properties of Highly-Secure Devices. Azure Sphere enables MCU manufacturers to build highly secure devices that are protected through their connection to the Azure Sphere Security Service. Designed for efficiency, Azure Sphere comes with Visual Studio tools that streamline development and can connect quickly to Azure or another public or private cloud of your choice. Learn more with an upcoming two-part Azure Sphere webinar. Customers across industries are implementing increasingly sophisticated IoT solutions in countless scenarios to achieve their own unique objectives. From launching new products to creating new services to streamlining operations, our customers continue to find new ways to leverage the Azure IoT platform. To stay ahead of advancing needs, Microsoft continues to innovate. Below is a short summary of how our innovations are enabling more sophisticated IoT solutions. We recently introduced multiple new features to Azure IoT Central. The new state measurement enables devices to report the current state of the device or its components. Our new event monitoring template enables users to set up roles to monitor and be alerted to critical events within minutes of an occurrence. Bulk device import and export enables users to set up a large number of devices in IoT Central at once using a csv file. Plus, IoT Central now leverages Azure Maps, giving users geographic context to location data. Introduced just over a year ago, Azure IoT Edge enables devices to act immediately on real-time data. And today it is available globally. Recent innovations have increased its flexibility. IoT Edge is now open-sourced and available on GitHub. We’re also offering support for the Mob container management system. And we’ve expanded the Azure Certified for IoT program to certify core edge functionalities like security and device management. Furthermore, IoT Edge integrates with Device Provisioning Service for more scalable deployments. Microsoft has the most comprehensive and secure portfolio of IoT offerings on the market. And while getting the technology right is critical for your IoT solution, it’s also important to connect with compatible partners. Microsoft relies on our extensive partner ecosystem to develop and implement secure, scalable, and repeatable IoT solutions that meet customers’ needs. To enable and expedite successful connections, IoT in Action events will feature a digital matchmaking tool designed to help attendees identify and meet the partner or customer most suited to their immediate business need or opportunity. To learn more, be sure to register for a one-day IoT in Action event in your area. 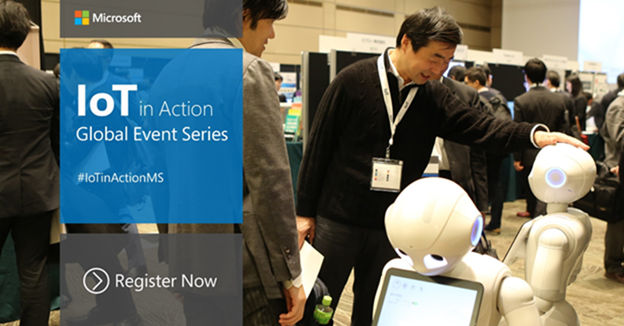 IoT in Action is an in-person event focused on addressing the latest topics around IoT security, innovations, and solutions. It’s a great opportunity to meet and collaborate with Microsoft’s customer and partner ecosystem. At this year’s event, we’re providing an increased number of hands-on technical sessions and in-depth learning around IoT security and Azure Sphere. By attending, you’ll gain actionable insights, deepen partnerships, and unlock the transformative potential of intelligent edge and intelligent cloud. Seats are limited so I recommend that you register today. Also, by registering early, you’ll get access to keynote slides from last year’s event as well as technical training resources for Azure and Windows IoT. This event is ideal for anyone interested in learning more about transforming business through IoT and for technical leaders looking for practical guidance. More locations and dates coming soon! Stay tuned for additional event dates and locations, and be sure to supplement your IoT learnings with the IoT in Action webinar series.